Governor Hassan signing SB 170, a bill that alters the state's Advance Directive form, into law. Advance directives—sometimes called living wills—let people decide who can make medical decisions for them and what invasive treatments should be avoided at the end of life. Many in the healthcare system say they are vital plans that ensure a patient’s voice is heard, but only 25% of Granite Staters have signed advance directives. Later this week we’ll look at efforts to increase that number, and the impact of not having a completed advance directive. We begin today with an introduction to the form and its latest re-write. Even doctors are surprised at how fast Ken Braiterman’s ALS, more commonly called Lou Gehrig’s disease, is progressing. Up until this year, Braiterman had lived in his own apartment. Now, at 64, he’s a resident of Harris Hill Nursing home in Concord. Confined to a wheelchair, a nurse helps with bathing and feeding. With health fading fast, Braiterman is thinking about the end of his life. Braiterman enjoys a little gallows humor, but he’s taking his final days seriously. His ALS may progress to the point where he can’t swallow or breathe on his own. Braiterman’s younger brother David, a Concord lawyer, will carry out those wishes if he becomes unable to make his own medical decisions. David is what’s known as his brother’s durable power of attorney for health care, sometimes called the agent. The brothers have gone over the variety of medical events Ken may face, and what he wants in each case. The plans are captured in his advance directive…a legal document sometimes called a living will. Every state has a system for advance directives. New Hampshire has one set form, a few pages long, available online and elsewhere. There’s no fee and it doesn’t even have to be notarized as long as there are two witnesses. There is a slight hitch, though. In the first section of the form, you designate the person who you want to make decisions for you, known as your agent. You can also decide what you want to do about medically administered nutrition and hydration, usually feeding tubes to keep you alive. Then, in part two, you can request that heroic efforts not be used--that only comfort care be provided. And then it asks again about medically administered nutrition and hydration. "No feeding tubes, no breathing devices. I don't want anything. I want to die peacefully and be left alone. I've always felt that way." LaFrance says by asking the question twice, it meant New Hampshire’s form didn’t line up with the forms in other states. So there were cases--not often, but some--where people who had directed that they not be kept alive by feeding tubes when death was otherwise imminent were given just that treatment because their forms were from out of state. With the legislature’s redraft of the advance directive statute, that problem has been fixed. And the new version still does make space for people to write in their wishes about nutrition and hydration. The use of nutrition and hydration to keep people alive where no chance of recovery is possible has at times been a politically divisive issue. That was certainly the case for Terry Shiavo. There was a protracted legal case between Shiavo’s husband and her parents. The husband, who had legal authority to make decisions, wanted to remove life support for Shiavo after a massive heart attack left her with severe brain damage. The parents, devout Catholics, unsuccessfully fought the removal of a feeding tube. The case garnered a wave of media coverage. 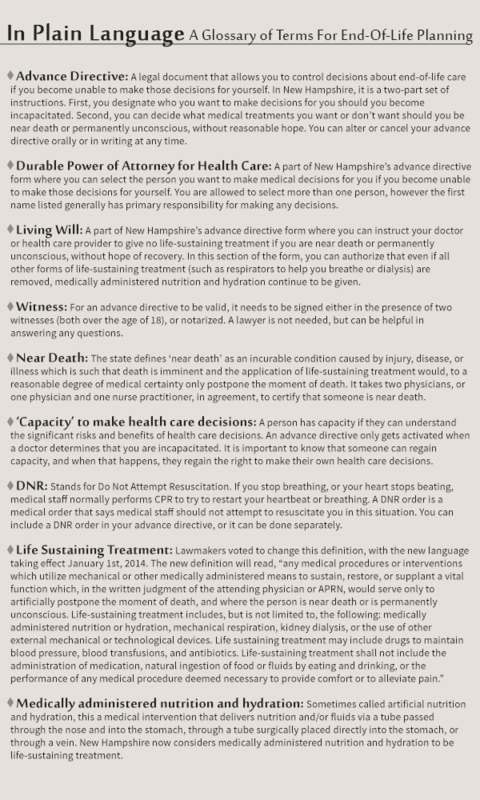 New Hampshire’s re-write of the advance directive statute was far less controversial. Some Republicans voted against the bill in the House, but it faced little opposition in the Senate, and the Catholic Diocese in Manchester was okay with the changes. Even with the altered form, Don Rabun still sees problems. He’s the state’s Long Term Care Ombudsman--basically the complaint department for New Hampshire nursing homes. He says what’s directed in the form doesn’t always get carried out. In Part 2 of our series, we’ll take a look at some efforts around the state to up those numbers, and make discussions of death a little easier.